Incepted in the year 1983, we, Dewani Pen Products, are engaged in manufacturing, supplying and trading a broad array of Wooden Pens, Gift Sets and Trophies. Under the offered array, we have Wooden Roller Pens, Wooden Ball Pen, Premium Pen Sets, Wooden Table Tops and Wooden Mobile Stand. 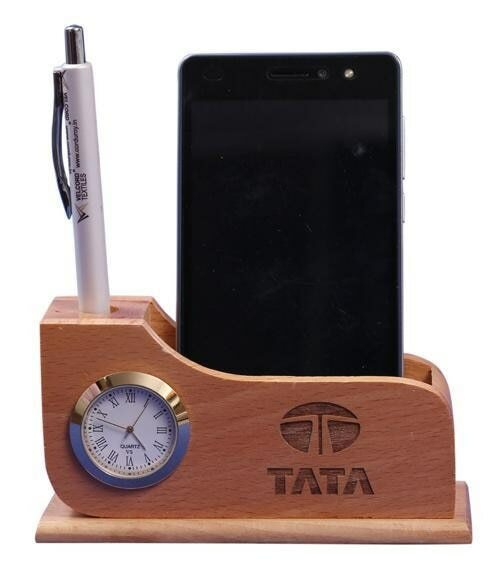 Along with this, we have Wooden Designer Stand, Wooden Frame Clock, Wooden Stands, Wooden Desk Calenders, Wooden Desk Accessories and New Wooden Table Tops, among others. The demand of these wooden products is rising at a rapid pace, owing to their extended life, smooth surface, fine finish, classy design, attractive patterns and resistance against termite. In an order to ensure that our offered wooden products possess the aforementioned features, we manufacture these using best grade wood and other requisite raw material that is procured from the most reliable vendors of the industry. We make use of modern machinery and latest technology in the manufacturing of these wooden products to ensure their intricate designs. Our professionals while manufacturing the offered wooden products keep in mind the latest market trends and established quality norms of the industry to ensure that these are able to stand tall on the expectations of patrons. To suit the varied needs of patrons, we also render Laser Engraving and Multi-color Digital Printing Services. We are providing : Wooden Ball Pens Wooden Trophies Wooden Gift Sets Wooden Made Key Rings Wooden Pen Stand Wooden Table Tops Wooden Pen Box Diamond Pen Wooden Exlucive Pen Stand Wooden Calender Wooden certificates Wooden Tea Coasters Corporate Gifting Dewani Pen in the year 1983, we, Dewani Pen Products, are engaged in manufacturing, supplying and trading a broad array of Wooden Pens, Gift Sets and Trophies. Under the offered array, we have Wooden Roller Pens, Wooden Ball Pen, Premium Pen Sets, Wooden Table Tops and Wooden Mobile Stand. Along with this, we have Wooden Designer Stand, Wooden Frame Clock, Wooden Stands, Wooden Desk Calenders, Wooden Desk Accessories and New Wooden Table Tops, among others. The demand of these wooden products is rising at a rapid pace, owing to their extended life, smooth surface, fine finish, classy design, attractive patterns and resistance against termite. In an order to ensure that our offered wooden products possess the aforementioned features, we manufacture these using best grade wood and other requisite raw material that is procured from the most reliable vendors of the industry. We make use of modern machinery and latest technology in the manufacturing of these wooden products to ensure their intricate designs. Our professionals while manufacturing the offered wooden products keep in mind the latest market trends and established quality norms of the industry to ensure that these are able to stand tall on the expectations of patrons. To suit the varied needs of patrons, we also render Laser Engraving and Multi-color Digital Printing Services.